Following a nuclear war, Australia is temporarily spared the death and destruction. This film could be compared to "Def Con 4". This film features suspense and romance. Gregory Peck and Ava Gardner are touching as ill fated lovers. 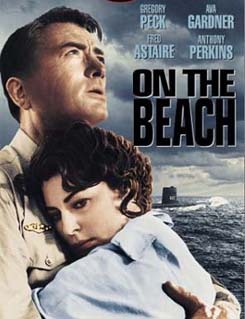 Anthony Perkins, as an Australian naval officer, delivers an uncharacteristically sympathetic performance. Fred Astaire scores big as an Australia-based man with a love of race cars. The cast includes: Gregory Peck, Ava Gardner, Fred Astaire, Anthony Perkins, and Donna Anderson.